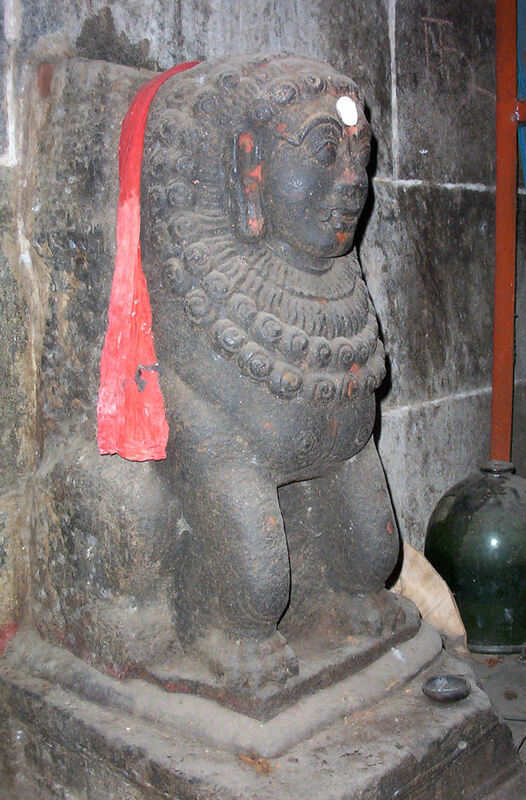 Sphinx called purushamriga guarding the temple entrance in Chidambaram. This article was originally published in Dutch in the magazine Bres, The Netherlands, in the august-september issue of 1996. Whenever people think of ancient Egyptian civilization, the Pyramids and the Great Sphinx are the first things that come to their minds. Their mysterious shape and their great hidden his¬tory have long captured the imaginations of people everywhere. Even from the times of the ancient Greeks and Romans, scholars have searched for answers to the Egyptian mysteries. For the past 200 years a scientific investigation by archeologists and historians has been going on, not only to unravel the riddle of the sphinx, but also to uncover the complete meaning of ancient Egyptian civi¬lization, religion and culture. This has been a painstaking process, needless to say. Time and two thousand years of a hostile religious environment have done great damage; buildings have been disfigured or have disappeared altogether. But the greatest damage is the total loss of the oral tradition that was the foundation of this great religious civilization. Because of this loss, our current understanding of ancient Egypt remains incomplete, with many questions unanswered. Nataraja, the Absolute, the Foundation of the Cosmos. In its rituals, mythology, and architecture, the temple preserves many secrets from the ancient past. Its tradition is Vedic, and has been passed on orally, unchanged for millennia. The temple com¬plex is one of the largest in India, covering an area of 13 hec¬tares. It is also one of the most unique, in that it is one of the very few temples where the practice of Vedic rituals has been maintained in unbroken continuity up to the present day. I grew up at this temple, and have been serving as a priest here for over twenty years, immersed in its long history, officiating its rituals, studying its structure, learning its secrets. Thus one can imagine my gradually mounting shock and surprise when, over a period of investigation, I saw and heard some of the deepest secrets of my ancestors’ temple’s tradition explained and illustrated by temples, frescoes, and texts that belonged to a civilization which had pros¬pered thousands of years ago, on a continent thousands of miles away. In Egypt we see the Great Sphinx of Gizeh guarding the Pyramids and watching the sunrise each day, and in the temple of Karnak we see rows of sphinxes guarding the entryways to the temple and wat¬ching over the passage of processions through broad lanes. At the east entrance to the temple, At the West entrance to the temple, the two rows of sphinxes wear ram’s heads, but at many other pas¬sage ways, double rows of human headed sphinxes stand guarding. In a far away land, on another continent, in this ancient Indian temple in Chidambaram, on a raised platform on either side of the main entrance are also sitting two sphinxes. As in Karnak, here too they guard the entrance. They are called Purusha Mukha, or “human face”, and have the body of a lion. According to legend, they are there to take away the sins of the people entering the temple; they also watch over the festival murtis, or images, which pass in procession through this Eastern entrance. Here, the eyes of these sphinxes are looking at the roof of a pillared pavilion where the twelve signs of the zodiac are carved on the ceiling a carving which, perhaps not incidentally, bears a resemblance to the famous zodiac ceiling panel of the Egyptian temple at Denderah just as the Great Sphinx of Gizeh gazes at the galactic zodiac. 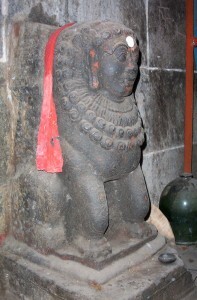 These are by no means the only sphinxes to be found in the Chidambaram temple. If, after passing through the Eastern entrance and descending the twenty one steps flanked by these two sphinxes, we turn left and follow the corridor lined with great stone pillars around clockwise, we still come to many more. At the center of the Southern corridor, as we emerge from the shadows into a courtyard area open to the light of the sky, our eyes are arrested by an imposing pillared edifice, a pavilion in the form of a chariot, with two giant stone wheels, drawn by two yoked stone horses. This is the Nritya Sabha, or Dance Hall, site of the mythological dance contest between Shiva and the goddess Kali. Drawing closer, we see beautifully sculpted panels filled with the intriguing figures of hermaphrodites, musicians, and exuberant dancers, lining the base of the structure. Raising the eyes slightly and coming still closer, we forget even to blink as hundreds and hundreds of miniature dancers, mythological figures, and mysterious symbols, which cover the pavilion’s massive twelve foot pillars, come into focus, each one carved in intricate detail on the granite columns. Dropping our gaze once again to the sculpted face of the plinth, we see that it is adorned with a number of layers, each with its own repeating motif. Just below eye level, on the top pattika or belt, is a breathtaking scene: a row of sphinxes, alter¬nating with lions, wrapping around the front part of the pavilion. These sphinxes face the golden flag mast, which has a similar position in temple structure to that of the Egyptian obelisk. Fol¬lowing their gaze beyond this flag mast, we enter, through a high doorway, the innermost courtyard of the temple. Just here, above the spot from which one can see both the Dancing Shiva, straight ahead, and the Dreaming Vishnu, off to one side, again we find the twelve signs of the zodiac sculpted into the ceiling, again under the gaze of the sphinxes. Sitting peacefully in their prominent and elevated position, they also witness, as they have witnessed for centuries, Lord Shiva’s Shanti Kuttu the Cosmic Dance of Peace and are filled with His Eternal Bliss. Following the row of sphinxes around to the West, we come to two forms of Siva in elevated niches projecting from the side of Nritya Sabha, one facing North and the other facing West. Pairs of elegant pillars, which support the roof of this attached, smaller pavilion, flank both murtis, or images. And at the base of each pillar is again the form of a sphinx . Male on one side and female on the other, these four sphinxes stoically support each pillar, and although all have fangs, they guard Lord Shiva with expressions of peace and benevolence. Although much about these sculptures is totally unique their place in the structure of the building, the style of the sculptural work, their jewelry, hairstyle, and facial expressions still they exhibit the unmistakable form of the sphinx: a human face with a lion’s body. And even though their position is prominent, these sphinxes seem to go unnoticed by the majority of visitors, and their resemblance to the sphinxes of Egypt has never, to my knowledge, been pointed out until now. The likeness of the sphinx is not only present in the struc¬ture and sculpture of the temple, but also plays an active part in the daily worship rituals. Indeed, herein may lay another point of connection with ancient Egypt. In reliefs and frescoes pharaohs can be seen presenting small, sculptured sphinxes to deities (often Osiris). Although the precise significance of these images has been lost, they do suggest that the sphinx played a part in daily ritual. Likewise, in the daily ceremonies of worship in the temple of Chidambaram, every morning and every evening, as a part of the protocol, a silver lamp is offered to Lord Nataraja: the dancing flame of its wick illumines a silver sphinx, standing firmly on its pedestal. With this presentation of the sphinx to the Lord, the sins of the devotees which are absorbed by the guardian sphinxes of the East entrance are burned off by Shiva’s benevolent gaze, as if dissipated by the flame. The result is the purification of all those gathered. In the tradition of this temple, the shape of the pyramid also has great importance and meaning, but in an unexpected way. In Vedic tradition, the fire sacrifice, called yajna (pronounced egna), is one of the most important rituals. The fire pit for this ritual sacrifice has the shape of a step pyramid, but upside-down. Essential for the sacrifice is the energy point within the pyramid, which is now also well known in the West. In viewing videos of computer simulations of how the temple Karnak must have appeared in the past, I could not help being struck with its great resemblance with the temple complex at Chidambaram, which is so familiar to me, especially as the latter is seen from the air. The towering gateways, the massive pillared halls, the sanctums, the procession ways, and the galleries of both temple complexes look in many ways uncannily similar. In front of the large gateways of the temple of Karnak, for example, stood several high flag masts. In addition, many pharaohs erected tall obelisks in pairs in front of these gateways. In India, likewise, it is part of the tradition to have a tall flag mast immediately in front of the shrine. Because of its place in the architectural structure, it appears likely that the function of the obelisks and the flag mast in Karnak, and the flag mast in Chidambaram and in every Hindu temple in India may be one and the same. As seen from the perspective of the worshippers inside the temple, they both soar toward the sky through the roof of the pillared halls. The name may be different, the shape may be diffe¬rent, and the material may be different; their respective roles in the rituals and the religion, nevertheless, may be one and the same. For example, in Egypt, as we know from reliefs and hierogly¬phic inscriptions, smaller and lighter obelisks were carried in the festival processions along with the gods. In the same way, in some Indian temple festivals, flag masts are carried in proces¬sion in front of the gods, and function as part of the ritual protocol. The meaning of the flag mast in India has been, and con¬tinues to be, preserved and passed on by a living oral tradition until today. The rituals and the mythologies of both temples show simi¬larities in many respects, for example in the worshipping of deities with food, music and dance, or in the concern for main¬taining purity in certain prescribed ways. The respective roles of the priesthood, the rulers, and the public, also bear many correspondences. In India, as in ancient Egypt, we also find a hereditary priesthood, the members of which take turns for their duty and service, and who have other occupations in addition to priestly life. I could mention many other points of potential connection, from mythology, ritual, architecture, astronomy and astrology, and from the civilization in generally. But as this article is intended as a general introduction rather then as an exhaustive study, I will refrain from doing so until such claims can be backed by further research. I invite other researchers to travel here, to my ancestors’ temple in Chidambaram, where for the past three thousand years, the tradition has been preserved without inter¬ruption. Here, in this holy city, perhaps scholars can find one more path or one more key to uncover the secret of the mysterious sphinx, and the role it played in Egyptian civilization. Perhaps someday soon we can solve some of the remaining riddles of Gizeh, Karnak, and all of Egypt’s mysteries. I am in no way arguing that the rituals and their meanings are exactly the same, exactly identical. But the similarities are too strong to be explained away as mere coincidence. There must be some connection; the question is what the nature of this connection may be. Might there be a historical connection between the two cultures, such that cultural transference may have occurred? Or might the connection have roots, which reach not through time but rather are embedded deeply in the panhuman psyche, archetypes born from the depths of the collective unconscious. I don’t have the answers to these questions, but neither are these questions unanswerable; indeed, the evidence that I have presented in this article compels us to seek out explanations. The first question calls for additional research in the areas of history and archeology; the second calls for insight into and further exploration of the nature of the human mind and the foun¬dations of mythological consciousness. Meanwhile, the question remains: Have sphinxes traveled to India?